A successful entrepreneur is continuously moving, making decisions, perfecting their vision, solving problems, and taking actions that are related to their business on a daily basis. A successful entrepreneur is passionate about their business or startup and will jump through any hoops to see it succeed. 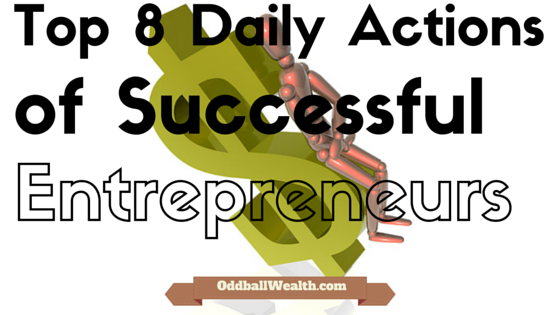 In the following paragraphs we’ll go over eight different actions that successful entrepreneurs take on a daily basis. Successful Entrepreneurs are always thinking ahead and looking into the future. They have a clear vision of where they want to go and know exactly what they need to do in the present, in order to accomplish their goals in the future. Most people try to avoid problems. To regular people, problems are inconvenient and can lead to headaches. Entrepreneurs on the other hand search for problems and view problems as opportunities for making money. Once they found or thought of a problem, entrepreneurs use their creative genius to find methods to solving those problems by using a marketable product or service they can sell. Most people complain about having to work 40 hours a week at their place of employment, and its true many entrepreneurs work 80-plus hours a week. The difference is entrepreneurs don’t think about the work they do as a job, instead they’re passionate about what they do and enjoy it. Entrepreneurs usually wish they had more time in the week so they could work longer and grow their businesses. Entrepreneurs are passionate about what they do and love telling other people about their passion. When explaining to others what they do, they don’t have to analyze the words they choose or think about what to say. Instead, the words just come out and others can see the entrepreneur’s enthusiasm in their voice and words, and in turn their words convince other people to work with them without much effort. Taking action is key to making a startup successful and entrepreneurs will take an action based on an instinct, or their gut feeling. There’s not another person out there that knows more about your startup or where you want to take it more than you. Entrepreneurs have to trusts themselves to make their own choices, plan on making many mistakes, and then growing from those mistakes. People who become indecisive because they’re afraid of rejection or making a mistake, will never become a successful entrepreneur. Many successful entrepreneurs have failed so many times in the past that they no longer think about a failure as “failing”, because the word “fail” to them is to lose all will-power and give up completely. Failures provide entrepreneurs with priceless knowledge and know-how that’ll allow them to succeed. Entrepreneurs will also test similar prototypes side-by-side to get a feel to what appeals more to their customers, sometimes referred to as A/B Testing. A/B Testing is extremely common to do with websites or blogs, by taking two different webpage themes, layouts, and responsiveness to see which webpage design visitors are more attracted to. Entrepreneurs don’t talk to try and impress others, they really don’t care what other people think. Instead, when entrepreneurs say they’ll do something, you can bet they’ll do it. As an entrepreneur starting out, there is always going to be people who doubt you or say that what you’re doing is unrealistic. Block them out, avoid them, or better yet use their doubt as motivation to prove them wrong! It can be hard when people we love don’t believe in us or say we can’t do something, because many times those are the people we’re excited to share our idea with and plan on them giving us emotional support along the way. These are also the people who have the most impact and influence over our decisions. Never become discouraged or let another person’s doubts have influence over you when it comes to doing something your passionate about. Instead, refer back to action “number 5” and always stick to your instinct and inner feeling. How entrepreneurs can become successful by applying, taking action, and doing these eight things on a daily basis.